Brianna never knew improvising could be so much fun, considering the only other improv experience she had was making up talking points while giving PowerPoint presentations in college. Brianna started doing improv in 2017. She began taking classes at the Providence Improv Guild (P.I.G.) before moving to the DMV, where she finished the improv curriculum at WIT in 2018. Brianna also performed in the 2018 FIST Tournament with the lady-prov trio Side Hustle. Brianna is originally from Rhode Island and attended college in Boston. Her obsession with her home state continues to be strong, like her New England accent, even though she currently works in Virginia in marketing/sales for a technology and communications solutions company. Not to brag but she also has an honorary Doctorate of Patience for annoying her boyfriend, John, through medical school (and now through his residency). 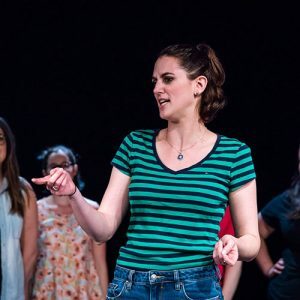 When Brianna is not doing improv you can find her in her car driving somewhere between Dulles and DC, on the phone with her beloved parents, or obsessing over her Boston Terrier, Lola.